ALEPPO, SYRIA, 11 Feb 2016: Our correspondent writes: "President Assad is not exterminating his people. I'm still alive, and no one said a word to me. If something bad happened to me in the near future, it would be because of the terrorists' policy of extermination. I'm living happily because there are Syrian soldiers who are defending us in hot summers and cold winters. 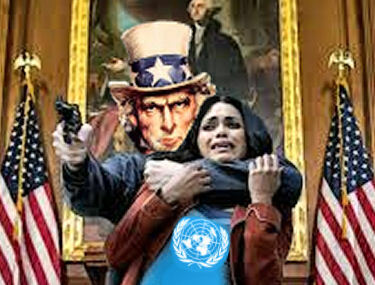 The UN is lying as usual in their reports about Aleppo and Syria in general." It's a new wave of propaganda that we have to face in Syria. Everything over here is way better than before. The Syrian Army and its allies are doing so well in Aleppo province (the city is still waiting though). I'm afraid though that the 'zombies' [means ISIS and their supporters -ed]of this world will take advantage of these lies and propaganda to 'justify' their future crimes, wars, and invasions. They did so several times in the past years. 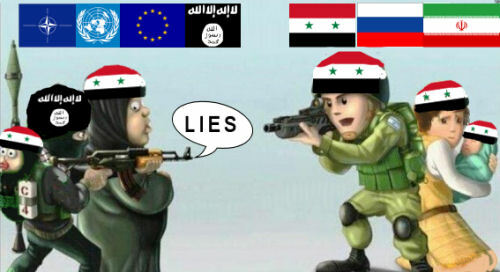 Each time the Syrian army succeed in defending the country, they (the trouble makers) create new conflicts and propaganda, a full package of lies, to twist realities on the ground and to end it to their sake and advantages. All the sacrifices of the Syrians would go in vain then. Let's hope that the zombies won't get away with it this time. People want this daily endless suffering to end as soon as possible. I am doing very well here. I thank you all for remembering me and circulating my humble news. - Are these numbers accurate? - Are they civilians or terrorists? Or are they the families of the terrorists? - Are these images new or recycled? (they did so so many times so far, and i can't trust their claims anymore). - if the SAA wants to liberate that part of Aleppo city or province, and the 'civilians' don't want to be trapped and want to leave, who is preventing them from doing so? The reality is that they are neither leaving nor letting the Syrian Arab Army (SAA) liberate those areas. A 'human shields' scenario might be the right answer of that argument [i.e. what is really happening - Ed. ], where they prevent the SAA from advancing while they blame it all on the SAA on the MSM. A small news: Couple of days ago, two explosions took place close by to where I live, and it ended that the first one was from a random mortar shelled from the terrorists areas, where it hit a building's roof, but the next one was from the blowing of the warming fuel cistern on that roof that got fire from the first mortar. No one had been injured. Heavy smoke was seen, and the fire fighters came and took care of the situation. It's not a big news as you see, but it shows that those 'moderate opposition' are neither moderates nor opposition. Yet they dare to lecture about rosy noble humanitarian causes about Aleppo. President Assad is not exterminating his people. I'm still alive, and no one said a word to me since I came. If something bad happened to me in the near future, it would be because of the terrorists' policy of extermination. I'm living happily here because there are Syrian soldiers who are defending us in hot summers and cold winters. The UN is lying as usual in their reports about Aleppo and Syria in general.